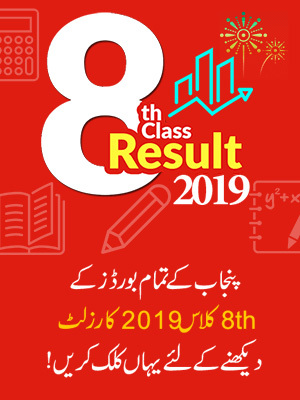 According to Board Officials Lahore Board Matric Result 2019 will announce on 21 July, 2019. 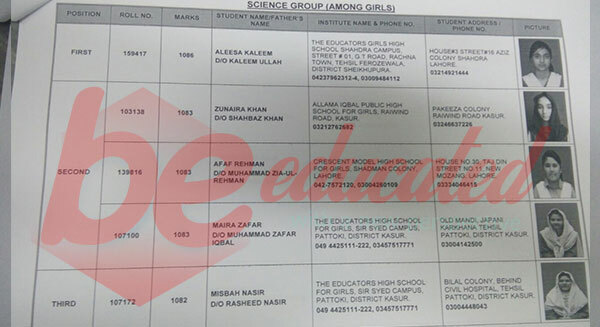 10th Class Matric Position Holders 2018 announced BISE Lahore Board conducted Matric 10th Class Exams 2019 in March and now matric students are waiting for the result. 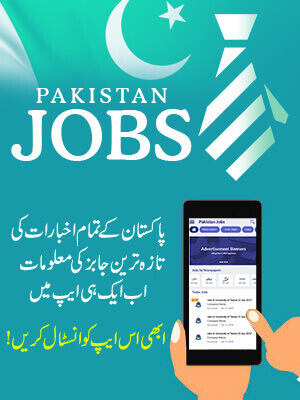 Results of matric students will be declared in the mid of July 2019. So keep calm and visit the same page to get further updates. 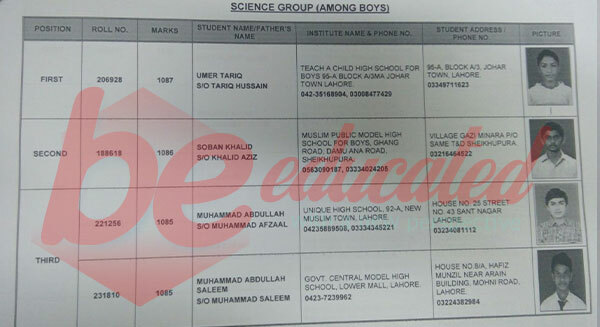 Board of Intermediate and Secondary Education Lahore has announced the result of matric 2019 and has also declared the position holders in each group who have marked the success among their name. Likewise in science group position holders among boys who scored the board with exceptional marks are Umer Tariq standing with 1st position in the Lahore board science group with 1087 marks whereas Soban Khalid grabbed the 2nd position with 1086 marks and the third position is hold by the duets Muhammad Abdullah and Muhammad Abdullah Saleem with 1085 marks. 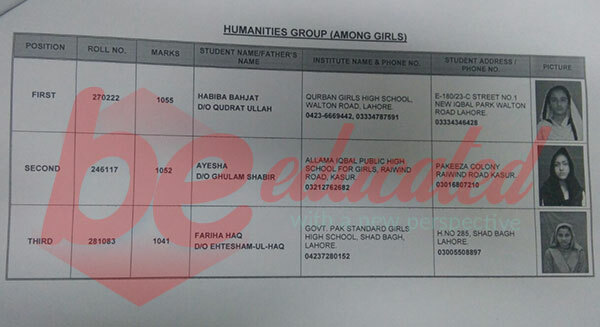 The students who have taken the first three positions in humanities group among girls are Habibah Bahjat as she holds first position by cracking 1055 marks, Ayesha stands with second position with 1052 marks where Fariha Haq hold the third position with 1041 marks. 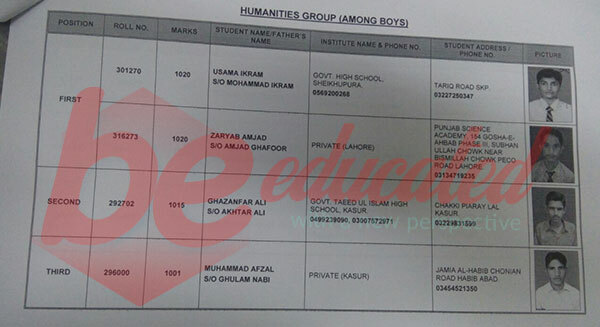 Whereas among boys in humanities group 1st position is hold by duets Usama Ikram and Zaryab Amjad with 1020 marks, 2nd position is hold by Ghazanfar Ali with 1016 marks, however Muhammad Afzal stands with 3rd position with 1001 marks. 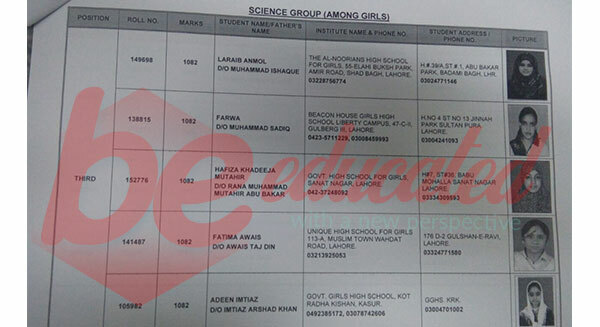 In Science group first-three positions among girls are taken by Aleesa Kaleem as she stand with first position in science group while scoring 1085 marks, 2nd position is hold by trio of students in girls Afaf Rehman, Zunaira Khan and Maira Zafar scoring 1083 marks, while Misbah Nasir, Laraib Anmol, Farwa, Hafeeza Khadeeja Mutahir, Fatima Awaisand Adeen Imtiaz stands with 3rd position with 1082 marks. 2019 BISE Lahore Board 10th Class annual exams were organised in the month of March. For this reason, board has decided the month of July for 10th class Result 2019 declaration. 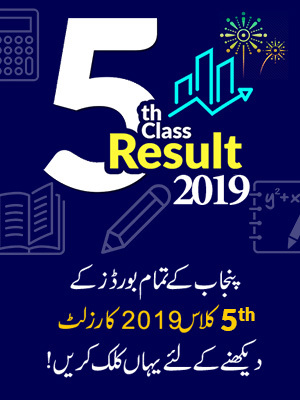 Students are advised to stay in touch with us for Lahore Board 10th Class Result 2019 as we will also upload the result here soon after its official announcement. Board of Intermediate and Secondary Education, Lahore was established to conduct the secondary and higher secondary school exams in the province and also in its affiliated areas. Due to provider of quality as well as standard education this board comes in front as the major board of the province. The main responsibilities of this board involves the student’s registration, making exams schedule, issuance of roll number slips, conduction of final exams an declaration of results. After announcement of final exams result, board also presented certificates to the position holders and also offer the scholarships to the students with high achieved marks. Be Educated will soon upload the result after its official announcement by board authorities. On the result declaration day official website of the board may not work but student can check their results here without any inconvenience. The board is responsible for providing education facilities to the districts affiliated with it. The jurisdiction of board includes the area of Lahore, Okara, Kasur, Nankana Sahib and Sheikhupura. At the time of its establishment Lahore baord was also conducting exams in other various regions including Baluchistan province, Azad Kashmir and Northern areas.